A gorgeous, statement vintage style headdress inspired by the flappers of the Art Deco 1920s, perfect for making a sparkly statement walking down the aisle. We imagine this with a slinky drop-waist satin dress, worn to a New Year's Eve wedding. How truly fabulous. Hundreds of tiny rhinestones are set on off white goose feathers and adorned with a central set rhinestone embellishment. Backed in our signature, gorgeously soft suede and set on a skinny (and comfortable!) ribbon wrapped band. 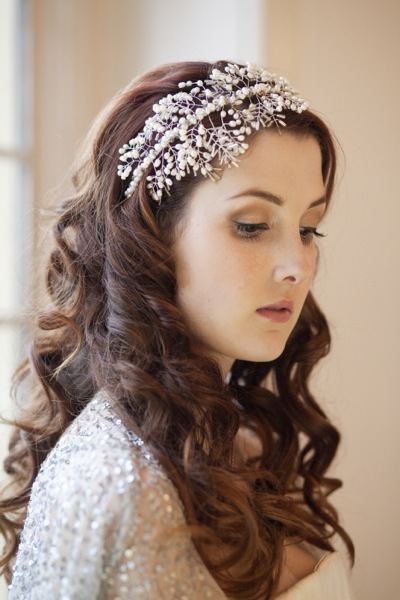 This fabulous flapper headdress is a standout piece from the Celebration Collection. Make a statement with this gorgeous piece, set with layers of French guipure lace, seed beads, and many sparkly rhinestones. Backed in our signature, beautifully soft suede, and set on a skinny (and comfortable!) ribbon wrapped band in brown or blonde. Photography by Hannah Mia Photography. The Lily of The Valley I Pearl Bridal Side Tiara is a beautifully delicate bridal headpiece. Composed of delicate branches of blush ivory seed beads set with freshwater pearls it twirls and swirls over your head in the most gentle of curves over the side of your head. 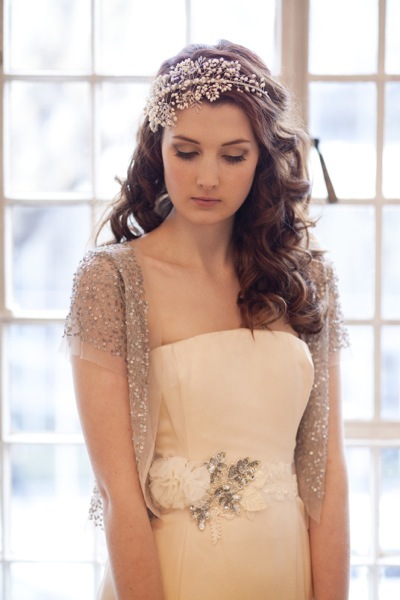 This headpiece looks absolutely stunning with a delicate lace wedding dress. 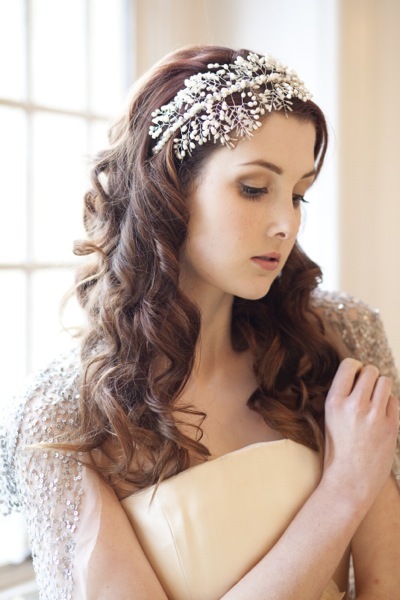 If you love this piece but want something to make a little bit more of a statement, do have a look at our Lily of The Valley II Headpiece – this is a double cluster headpiece which has detail on both sides, and a slightly heavier centre for more impact.